Winning the first Tchaikovsky Competition in Moscow at the height of the Cold War in 1958 brought Van Cliburn unprecedented celebrity for an American concert pianist. Cliburn’s international victory instilled a fresh sense of artistic pride in many Americans, while opening the door to a new era of cultural relations between East and West. The Van Cliburn International Piano Competition was established shortly thereafter to perpetuate Van Cliburn’s unique legacy of demonstrating how classical music, in the hands of a master, has the appeal to reach across all borders. Van Cliburn’s victory at the Tchaikovsky Competition is celebrated with a ticker-tape parade in New York city. At a dinner banquet in November 1958, Dr. Irl Allison, founder of the National Guild of Piano Teachers, passed a note to Grace Ward Lankford, co-founder of the Fort Worth Piano Teachers Forum. The note read, “Hold onto your seat, I have a startling announcement!” Standing before a crowd of 500, including Van Cliburn and his mother, Rildia Bee O’Bryan Cliburn, Dr. Allison announced his intention to offer a $10,000 first prize to be awarded by an international piano competition named in Cliburn’s honor. The idea caught everyone (especially Van Cliburn) by surprise, and immediately ignited the imagination and enthusiasm of music lovers and civic leaders throughout Fort Worth. Downtown Cowtown, Fort Worth, Texas. This card features a photo taken by John A. Stryker published by Western Fotocolor in the early 1960s. By 1961, the pieces were falling into place, and the Van Cliburn Foundation was officially chartered. Candidates drawing numbers at the inaugural Van Cliburn International Piano Competition in 1962. First held in 1962, the quadrennial Van Cliburn International Piano Competition quickly established itself as an event that inspires and engages the local community, while gracing the international stage. The Cliburn Competition is one of the few musical events in the world to arrange for competitors to stay with host families, often resulting in close, long-term relationships: this has resulted in southern hospitality becoming a singular trademark of the Cliburn Competition. 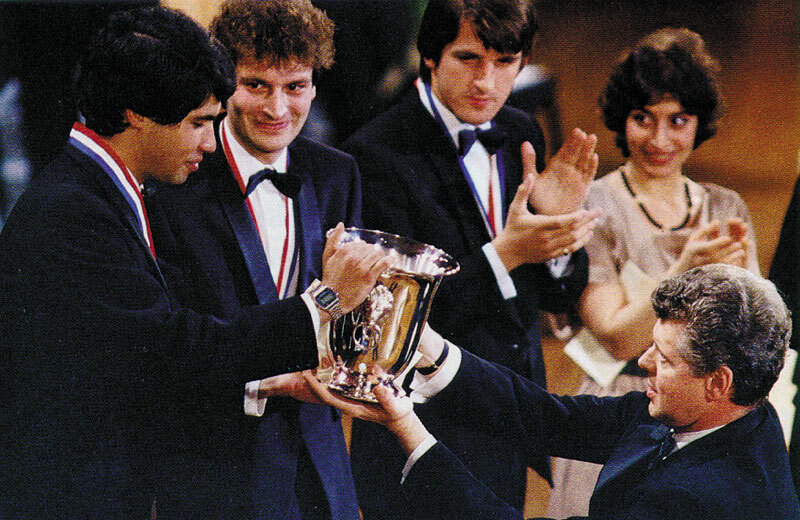 José Feghali receives the top award from Van Cliburn in 1985, flanked by Philippe Bianconi, Barry Douglas, and Emma Takhmizian. Photo: Fort Worth Star-Telegram / Ron Jenkins. Over the past four decades, the Cliburn Competition has involved hundreds of great musicians, music professionals, and dedicated individuals in its various activities. Its juries have included Jorge Bolet, Philippe Entremont, Rudolf Firkusny, Leon Fleisher, Malcolm Frager, Alberto Ginastera, Howard Hanson, Nicole Henriot-Schweitzer, Lili Kraus, Alicia de Larrocha, Dame Moura Lympany, Nikita Magaloff, Gerald Moore, John Ogdon, Cecile Ousset, György Sándor, Harold Schonberg, Maxim Shostakovich, Soulima Stravinsky, Walter Susskind, Alexis Weissenberg, and Earl Wild. Among the conductors who have shared the stage with competitors during the final round of the competition are Leon Fleisher, John Giordano, Milton Katims, Ezra Rachlin, Walter Susskind, Stanislaw Skrowaczewski, and Jerzy Semkow. Maestro James Conlon conducted the final rounds of the Tenth, Eleventh, Twelfth, and Thirteenth Competitions, and Maestro Leonard Slatkin conducted the final round of the Fourteenth Competition in 2013. For the Fourth Competition in 1973 through the Fourteenth Competition in 2013, John Giordano served as chairman of the jury. John Giordano, Jury Chairman for ten Cliburn competitions, 1973–2013. From its inception, it has been the mission of the Cliburn to identify and sustain the young talents of classical music. In addition to receiving significant cash prizes—the first prize cash award was raised to $50,000 for the 2013 Competition—the winners of each competition are awarded three years of career management and artist services, including the booking of national tours for all six finalists and international engagements for the gold medalist, in conjunction with IMG Artists. The six 2013 finalists are traveling the globe and will collectively perform over 400 engagements during the three years following the Competition. The Van Cliburn International Piano Competition is the most visible expression of the Cliburn’s commitment to classical music, and through the support of major corporations, foundations, and sponsors, significant media projects have been produced to further the Cliburn’s scope and reach. These include the national and international distribution of CDs and DVDs, and the broadcast of prizewinning performances on syndicated radio programs across the country. Additionally, the Cliburn has produced nine documentaries that have aired nationally on PBS since the 1977 Competition and have garnered acclaim and numerous awards, including a Primetime Emmy® (1989) and a Peabody Award (2001). A Surprise in Texas, the Peter Rosen film chronicling the 2009 Competition, was enthusiastically received at U.S. film festivals, then reached a potential audience of over 105 million households with its prime time PBS airing on September 1, 2010. The film won the 2011 ECHO Klassik Award for Best Music DVD Recording of the Year (Documentation). The documentary for the 2013 Competition, Virtuosity, was produced by Lori Miller and directed by Chris Wilkinson, and aired on PBS stations July 31, 2015. In October 2015, it won the Czech Crystal Award for best documentary at the 2015 International Television Festival Golden Prague. In 1997, the Cliburn began utilizing sophisticated Internet resources to stream the competition live online, extending its outreach to every corner of the globe. Available at Cliburn.org, the webcast brought the Competition to life around the world in real time with over 110 hours of live broadcasts of performances, interview segments, and awards ceremonies during the 17-day period to 155 countries and over 500,000 people, for a total of over 13 million minutes streamed. For the Fifteenth Van Cliburn International Piano Competition, the Cliburn partners with medici.tv, the world's leading classical music channel ! The Competition takes place May 25 – June 10, 2017, at Bass Performance Hall in Fort Worth, Texas, USA. The #cliburn2017 webcast will encompass over 110 hours of live performances, announcements, interviews, featurettes, and other behind-the-scenes footage. All content will be available both live and on demand for free to viewers around the world at cliburn2017.medici.tv !